up, RamNation. Life is about moments, and last night was a tough one. other guy takes advantage of your mistakes. That's what occurred last night. throws. They hit big shots and long shots. The Spiders capitalized. could use to ratchet up the octane levels. run that established the lead. But again, Richmond made plays down the stretch. require work, and get to work. be the Hawks? Duke in 2007? UNCW in 2005? South Florida in 1992? You want to be Gonzaga the other night against Butler? champions, is made from looking forward, not back. By the time lunch is over, LaSalle needs to be the focus. Don't get me wrong, I'm randomly cursing to nobody in particular about nothing in particular, other than last night's loss. Nobody likes to lose. 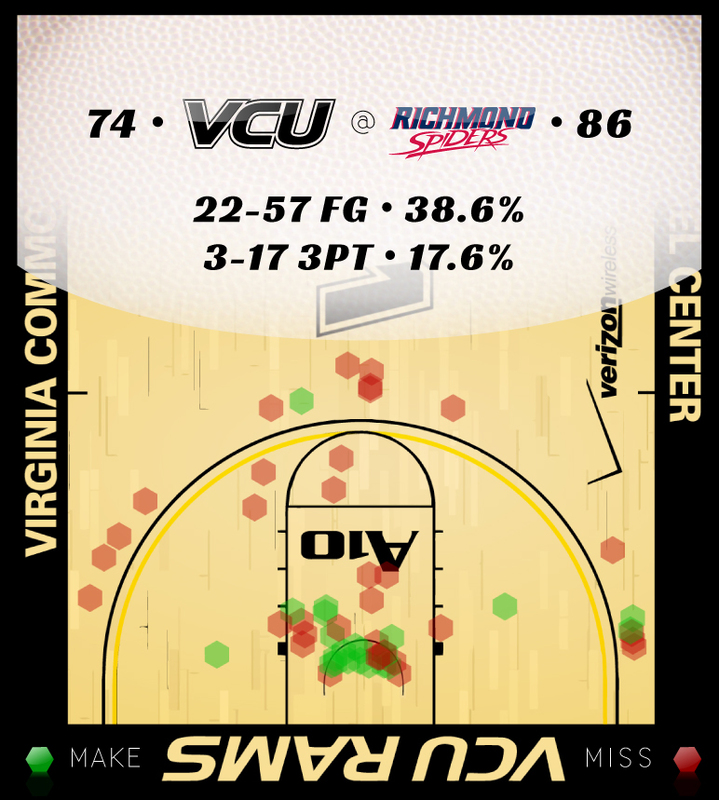 (see below), VCU would've trailed by double digits at the break. don't think his absence in overtime can be underestimated. poor shooting nights by creating extra possessions via the turnover. Last night, both teams committed 13 turnovers. VCU made three of 17 three point attempts on the night. That's 37-144 (25.7%) over the past six games, and 25-113 (22.1%) if you throw out the Duquesne game. That must improve. You can talk all you want about defense and end game situations. Semantics. We've just got to start knocking down threes at a better clip. Or, VCU lost. Next question. VCU trails by double digits.